The United Nations Fund for South-South Cooperation (UNFSSC), a voluntary trust fund established by Member States to support South-South cooperation partnerships for the benefit of developing countries around the world, has been gaining momentum this year, shown by increases in cooperative activity and contributions to the Fund. 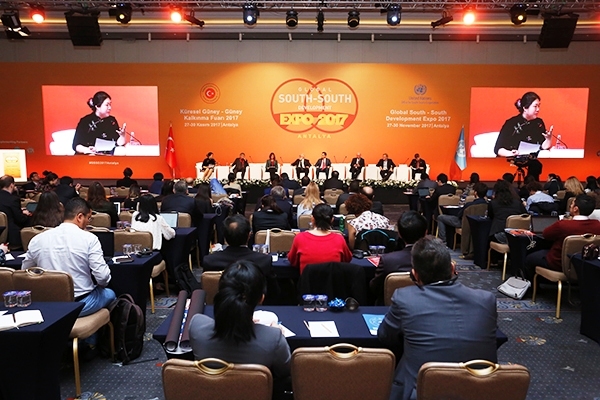 In 2017, the Global South-South Development (GSSD) Expo was hosted by the Government of Turkey in Antalya. GSSD Expo is an annual event organized by the United Nations Office for South-South Cooperation (UNOSSC) in collaboration with United Nations agencies and other partners. The event strategically engaged all development actors, including the private sector, civil society, academic and philanthropic organizations, to scale up concrete Southern-grown initiatives to help achieve the 2030 Agenda for Sustainable Development. More than 800 delegates from over 120 United Nations Member States participated in the 2017 Expo, which featured 37 sessions organized by close to 50 institutional partners. The South-South Development Center (SSDC), a partnership between the China International Center for Economic and Technical Exchanges (CICETE) and UNOSSC, successfully completed China Development Report on South-South Cooperation IV in 2017 which aims to present a systematic analysis of the history of the economic and trade cooperation between China and Africa. In addition, the SSDC provided five new small grants to SSDC members to facilitate South-South knowledge sharing and technology exchange in areas including sustainable building materials; small hydropower; and agricultural development. The Third Regional Networking Forum for the Arab States, Europe and the CIS on Scaling Up Southern Development Solutions through Advanced Youth Leadership was conducted as a side-event of the GSSD Expo 2017 in Antalya, Turkey in November 2017. It joined over 60 participants, including national focal points, heads and high-levels of international and regional organizations and institutions, OIC institutions, and UN agencies and funds contributing to empowering youth as key actors in attaining the SDGs. The South-South Global Assets and Technology Exchange (SS-GATE), established as a global and sustainable South-South transaction platform to facilitate market-driven, transparent exchanges of technology, assets, services and financial resources among the private sector, public sector, and civil society, underwent a final project evaluation. This evaluation found that SS-GATE was well established and successfully carried out its mandate. Overall, the platform was effective, efficient, well maintained and sustainable. UNOSSC welcomed the transition of SS-GATE to sustainability with the Secretariat as an independent organization and encouraged the organization to explore ways to maintain and enhance the platform. The United Nations Southern Climate Partnership Incubator (SCPI), a joint initiative between the Executive Office of the Secretary-General and UNOSSC to foster, support, and promote South-South and triangular cooperation on climate change, organized a High-level Forum on South-South Cooperation on Climate Change titled, “Partnership for Climate-Friendly and Sustainable Development: Southern Countries in Action” at the 22nd Conference of Parties to the United Nations Framework Convention on Climate Change (UNFCCC) in Bonn, Germany. 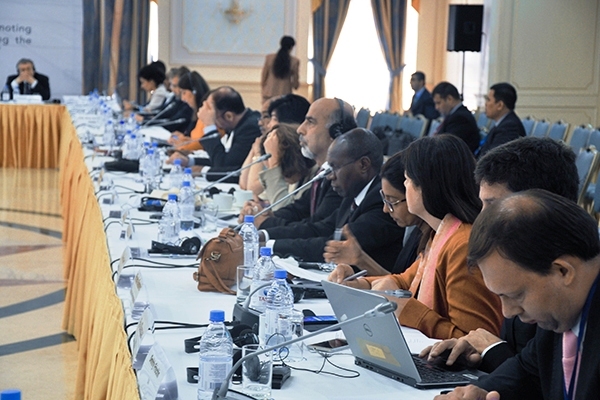 The event was attended by senior officials from over one dozen developing countries as well as participants from member states, civil society groups, financial institutions, and business men and women. The United Nations officially announced the South-South Cooperation Action Plan, which is an integral part of the implementation of the Secretary-General’s United Nations system-wide Climate Change Engagement Strategy. The Maritime-Continental Silk Road Cities Alliance (MCSR CA) is an initiative launched, under the umbrella of the “Belt and Road Initiative” championed by China, to promote dialogue between cities and facilitate the building of partnerships for development at the city level. UNOSSC and China International Centre for Economic and Technical Exchanges, under the Ministry of Commerce, jointly implemented a new global project in September 2017 to support the institutional building of the MCSR CA. Since then, the MCSR CA have been organizing or planning several activities and exhibitions, and participating at several global events including the UN Habitat’s World Urban Forum 9 in KL, Malaysia; 2018 High-Level International Forum on Sustainable Urban Development in Chengdu, China; Bridges for Cities Forum in Vienna, Austria; and the World Green Economy Summit in Dubai, UAE. 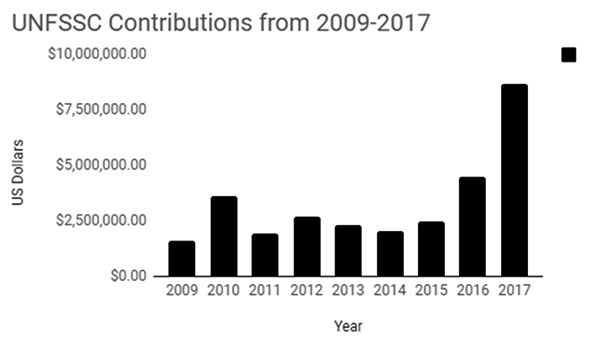 In addition, contributions to the fund have had an upward trajectory, as member states and organizations contributed $8.5 million towards innovative pilot SSC projects, nearly double that of the previous year. Finally, this year, the United Nations Office for South-South Cooperation (UNOSSC) developed a new strategic framework for 2018-2021. This framework responds to requests from member states to strengthen knowledge-sharing and access to high-quality advisory services, as well as facilitate demand-driven initiatives that address the needs of developing countries. 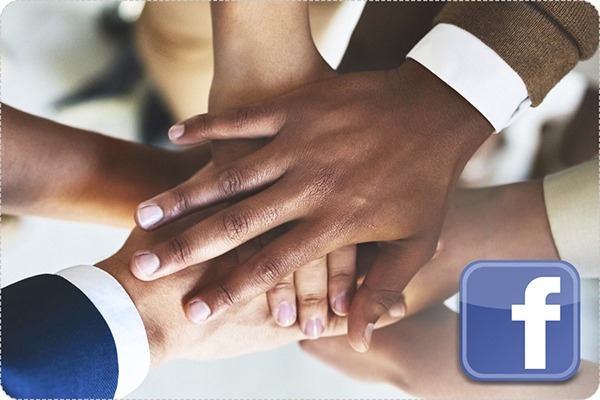 UNOSSC is actively working to provide advisory services and promote knowledge of South-South principles and practices gained during the management of the UNFSSC as well as other UNOSSC trust funds. For more information on UNFSSC, please visit the UNFSSC Website or download the latest Portfolio Report. For questions about UNFSSC, please contact Mithre Sandrasagra at mithre.sandrasagra@unossc.org or Grace Wang at xiaojun.wang@unossc.org.